On February 25th 1545, a troupe of comic actors signed legal documents to become the first incorporated theatre company; symbolically, Commedia dell’Arte was born, and it began to spread through public squares, royal courts and theatres all over Europe. Odd Eyes Theatre celebrates this international theatre with workshops, events and plays every year. In 2012, the annual Commedia dell’Arte Day coincided also with the official birth of ISCaD, the organisation that was going to become Odd Eyes Theatre. 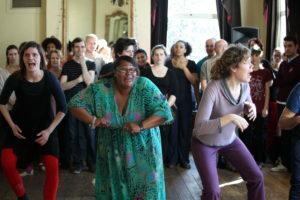 We celebrated the event with a day of sharing and training led by Paola Cavallin and Didi Hopkins to popularise this hugely influential physical theatre tradition which informed theatre from Punch and Judy to Shakespeare and beyond. Using leather masks, physicality and improvisation participants explored Commedia dell’Arte characters Zanni, Zagna, Arlecchino, Pantalone, Dottore, Capitano and the Lovers working toward a final performance. 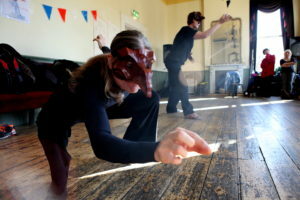 Commedia dell’Arte is a great way to develop physical awareness, expand your means of communication and enjoy a completely new experience while deepening in the history of performing arts and in the international cultural atmosphere of London. The great pictures below were taken by Celal Teber, ISCaD’ member and professional photographer.